Do you think this is being taught in American primary, secondary and college level Classrooms today? In my opinion it should be and every American should be taught this! This is the full text of the chain email received by PolitiFact about the Barbary pirates and Islam…as well as Politifact’s ruling on the accuracy of the email. Beginning in 1784, seventeen years before he would become president, Thomas Jefferson became Americaâs Minister to France. That same year, the U.S. Congress sought to appease its Muslim adversaries by following in the footsteps of European nations who paid bribes to the Barbary States, rather than engaging them in war. In July of 1785, Algerian pirates captured American ships, and the Day of Algiers demanded an unheard-of ransom of $60,000. It was a plain and simple case of extortion, and Thomas Jefferson was vehemently opposed to any further payments. Instead, he proposed to Congress the formation of a coalition of allied nations who together could force the Islamic states into peace. A disinterested Congress decided to pay the ransom. In 1786, Thomas Jefferson and John Adams met with Tripoliâs ambassador to Great Britain to ask by what right his nation attacked American ships and enslaved American citizens, and why Muslims held so much hostility towards America, a nation with which they had no previous contacts. Despite this stunning admission of premeditated violence on non-Muslim nations, as well as the objections of many notable American leaders, including George Washington, who warned that caving in was both wrong and would only further embolden the enemy, for the following fifteen years, the American government paid the Muslims millions of dollars for the safe passage of American ships or the return of American hostages. The payments in ransom and tribute amounted to over twenty percent of the United States government annual revenues in 1800. Jefferson was disgusted. 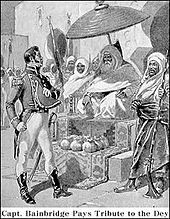 Shortly after his being sworn in as the third President of the United States in 1801, the Pasha of Tripoli sent him a note demanding the immediate payment of $225,000 plus $25,000 a year for every year forthcoming. That changed everything. He dispatched a squadron of frigates to the Mediterranean and taught the Muslim of the Barbary Coast a lesson he hoped they would never forget. Congress authorized Jefferson to empower U.S. ships to seize all vessels and goods of the Pasha of Tripoli and to âcause to be done all other acts of precaution or hostility as the state of war would justifyâ. The war with Tripoli lasted for four more years, and raged up again in 1815. The bravery of the U.S. Marine Corps in these wars led to the line âto the shores of Tripoliâ in the Marine Hymn, They would forever be known as âleathernecksâ for the leather collars of their uniforms, designed to prevent their heads from being cut off by the Muslim scimitars when boarding enemy ships. Islam, and what its Barbary followers justified, doing in the name of their prophet and their god, disturbed Jefferson quite deeply. America had a tradition of religious tolerance. In fact, Jefferson himself, had co-authored the Virginia Statute for Religious Freedom, but fundamentalist Islam was like no other religion the world had ever seen. A religion based on supremacism, whose holy book not only condoned but mandated violence against unbelievers was unacceptable to him. His greatest fear was that someday this brand of Islam would return and pose an even greater threat to the United States. This should bother every American and Canadian. That the Islamic âreligionâ has brought about women-only classes and swimming times at taxpayer-funded universities and public pools; that Christians, Jews, and Hindus have been banned from serving on juries where Muslim defendants are being judged, Piggy banks and Porky Pig tissue dispensers have been banned from workplaces because they offend Islamist sensibilities. Ice cream has been discontinued at certain Burger King locations because the picture on the wrapper looked similar to the Arabic script for Allah, public schools are pulling pork from their menus, on and on in the newspapersâ¦. Itâs death by a thousand cuts, or inch-by-inch as some refer to it, and most Americans and Canadians have no idea that this battle is being waged every day across America and Canada. By not fighting back, by allowing groups to obfuscate what is really happening, and not insisting that the Islamists adapt to our own culture, the United States and Canada are cutting their own throat with the politically correctness knife, and helping to further the Islamic / Muslim agenda. Sadly, it appears that todayâs North America would rather be politically correct than victorious. Those who don’t know HISTORY are destined to REPEAT IT! Also remember Muslims are ordered to “lie, cheat, steal and murder or do anything that advances the takeover of the world by the Muslims.” Let that sink in as every day we see more and more Muslims showing up and taking high level positions in our state and federal government. What happened to common sense? See more previously….American diplomatic action with Algeria, the other major Barbary Coast State, was much less productive than with Morocco. Algeria began piracy against the U.S. on 25 July 1785 with the capture of the schooner Maria, and Dauphin a week later. All four Barbary Coast states demanded $660,000 each. However, the envoys were given only an allocated budget of $40,000 to achieve peace. Diplomatic talks to reach a reasonable sum for tribute or for the ransom of the captured sailors struggled to make any headway. The crews of Maria and Dauphin remained in captivity for over a decade, and soon were joined by crews of other ships captured by the Barbary States. Various letters and testimonies by captured sailors describe their captivity as a form of slavery, even though Barbary Coast imprisonment was different from that practiced by the U.S. and European powers of the time. Barbary Coast prisoners were able to obtain wealth and property, along with achieving status beyond that of a slave. 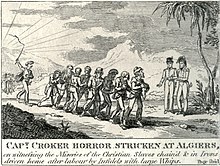 One such example was James Leander Cathcart, who rose to the highest position a Christian slave could achieve in Algeria, becoming an adviser to the bey (governor). Even so, most captives were pressed into hard labor in the service of the Barbary pirates, and struggled under extremely poor conditions that exposed them to vermin and disease. As word of their treatment reached the U.S., through freed captives’ narratives and letters, Americans pushed for direct government action to stop the piracy against U.S. ships. Jefferson reported the conversation to Secretary of Foreign Affairs John Jay, who submitted the ambassador’s comments and offer to Congress. Jefferson argued that paying tribute would encourage more attacks. Although John Adams agreed with Jefferson, he believed that circumstances forced the U.S. to pay tribute until an adequate navy could be built. The U.S. had just fought an exhausting war, which put the nation deep in debt. Federalistand Anti-Federalist forces argued over the needs of the country and the burden of taxation. Jefferson’s own Democratic-Republicans and anti-navalists believed that the future of the country lay in westward expansion, with Atlantic trade threatening to siphon money and energy away from the new nation, to be spent on wars in the Old World. The U.S. paid Algiers the ransom, and continued to pay up to $1 million per year over the next 15 years for the safe passage of American ships and the return of American hostages. A $1 million payment in ransom and tribute to the privateering states amounted to approximately 10% of the U.S. government’s annual revenues in 1800. And what choices do American Voters and the American Congress and Senate face today as we are proceeding into an election? Do you talk about this with your fellow citizens, friends and family members? Today’s description of these radical, extremely horrendously cruel Muslims is “Islamic Terrorists” which neither President Barack Obama nor Presidential candidate Hillary Clinton will speak the words to identify them as “Islamic Terrorists”. And Bernie Sanders will leave the whole subject to those in the far east to solve. Where does this leave you as a voter? Do you just ignore it and the welfare of yourself and your country…just so that you can vote for the Democratic Liberal Progressive Party…regardless of the consequences? As a citizen, if you do not want to protect this country that so many have given their blood and lives for I am very concerned about your sanity and love and loyalty for this country! How does an American voter cast a vote for someone who will not take action to protect this country? How does a candidate qualify as a Presidential candidate if they will not tell the truth when taking the Oath of Office of the United States? We are so grateful to our founding forefathers including John Adams, Thomas Jefferson, George Washington and many others including our military and wonderful United States Marine Leathernecks who stood up to these barbaric individuals and stopped them from enslaving and killing our navy sailors and army soldiers as well as stopped them from taking your tax dollars in ransom and payments. Our country needs these kinds of leaders today that will protect Americans, our country and our tax dollars. Will you vote for these kinds of leaders that will protect us? Clearly, the brutality of the Islamic State doesn’t have a stopping point. As every week passes they continue racking up atrocities. With every passing day the brutality of the Islamic State is emboldened and there is no reason to believe the atrocities will subside. Until a strategy is put together to crush their fighters both physically and mentally, ISIS will remain a threat to the civilized world. May God Be With Us! As readers of this history lesson…I hope that you will share it with as many as possible!